Start the new school year off with this positive ice breaker. No age limits!!!! Don't you sometimes wish that you could "freeze time"? What is meant by "Turn Over A New Leaf"? These beginning and end of the year activities may have your students finding answers to these questions! How Do Velcro Dots Help to Regulate Behavior? Calm Down Button, Better Behavior Button, Think About it Button, Best Behavior Button, Be Nice Button....whatever you want to call it.....it worked! Classroom behavior problems? You might want to try this! Earth Day Train of Ideas- Make A Log Cabin from Paper Tubes! Use any of 3 options to make an authentic log cabin with wrapping paper cardboard tubes or paper towel cardboard tubes as your main building supplies! Dfferentiated options are appropriate for grades 3-6. Aloha! Make Hawaiian leis out of plastic bags! Get the whole family involved in these fun times word games. It only takes a minute to play. It only takes a few minutes to make using plastic containers that would otherwise be thrown out! Day 4 of the Earth Day Idea Train ... How Can We Re-Purpose Throw-Away Plastic? Subtraction in action!!! Make a subtraction machine from a recycled plastic container. Subtract plastic from the environment and do the math! Get your kids involved in an Earth Day make and GIVE project. Earth Day Train of Ideas...hop aboard for new ideas and share yours! Let's shake them up with our easy to make dice rollers...no muss, no fuss, cleaner environment. Earth Day Train of Ideas- Hop Aboard! Earth Day Train of Ideas.......need some ideas?.....Help yourself here and please add more of your own in the comments section of the post. 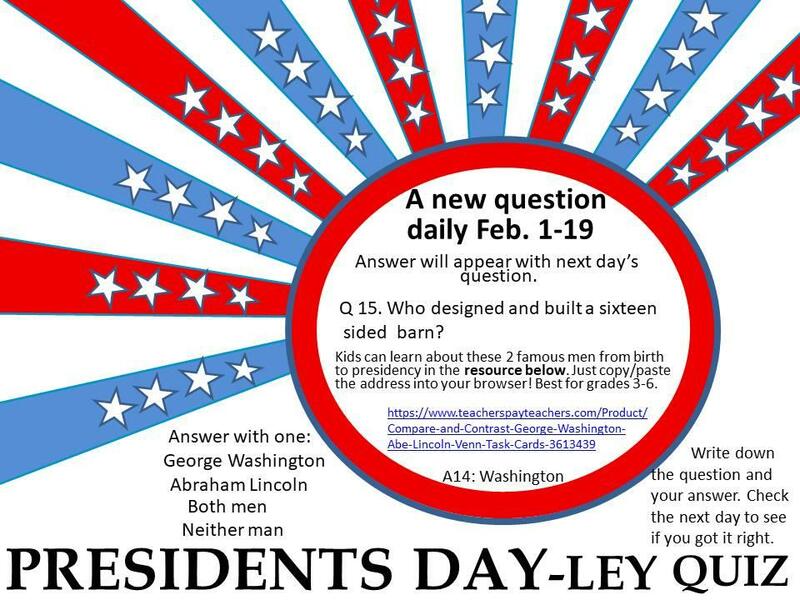 I hope you've enjoyed playing along with the Presidents Day-ley questions. If you'd like to see more of my free and paid resources, you can visit my shop at https://www.teacherspayteachers.com/Store/Margo-Gentile. While you're there, I hope you decide to follow me to get the latest updates and news of my ever-expanding inventory of educational resources for grades preK-6. All you have to do to follow is click on the green star next to my name.Thank you! It's almost the last day! Come and get question #18 now! We're getting close to the finish line with the Presidents DAY-ley quiz questions! Question # 17 ......almost at the last question. Come and get it! Presidents Day question # 16.